We are happy to announce a worldwide sales agreement with H2Flow Controls, manufacturer of the New & Revolutionary FlowVis product. FlowVis is the most advanced, affordable and reliable precision Flow Meter designed specifically for pools, spas, fountains and water features. 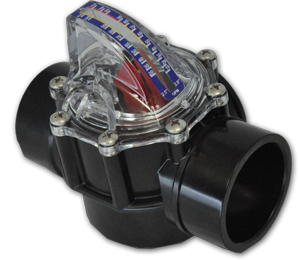 But FlowVis is more than just a flow meter; it's also a fully functioning check valve! Ingenious in concept and flawless in operation, FlowVis is revolutionizing the way pool pumps operate. For additional information, product video and literature, please visit our H2Flow FlowVis Flow Meter webpage or email your Export Manager.